I’ve known inspiring woman Marg Marshall for more than 20 years. We are friends first, and it was with much trepidation that I decided to take Marg Marshall on as a personal training client many years ago. I simply could not think of someone else to refer her to her case was so complex. Marg needed her personal training to be absolutely and totally 100% right or she would relapse. There was much at stake. I just could not take the responsibility for referring her to anyone else so I took her on my self – and oh what a journey it has been. 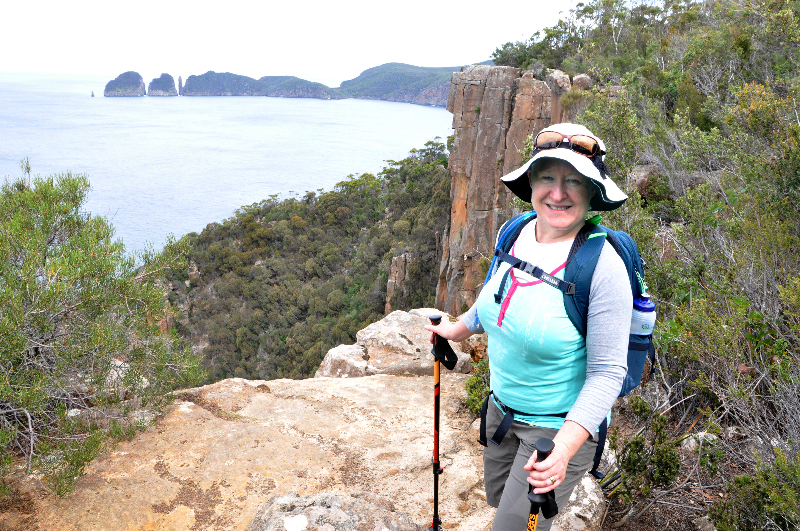 From over 2 years on crutches to a 30 km endurance walk – Marg Marshall is a very inspiring woman. Here is her story. In 2006, when I was pregnant with my second daughter, I was diagnosed with symphysis pubis dysfunction. This is a debilitating condition, not as uncommon as you might think, and meant that I couldn’t walk without crutches. I spent the rest of the pregnancy, and the following 2 years, on crutches. In the time since, I have had a couple of relapses, where I’ve ended up back on crutches. After my daughter was born, it became clearer to the medical professionals that I wasn’t a “normal case”. I’m not actually certain what a “normal case” might be, but no-one I spoke to had seen the level of damage that I had to my pubic bone. I had a separation of several millimetres, and significant bone wastage. I visited various doctors. I had a specialist in rheumatology, a physiotherapist, a pain specialist and my GP. The child health nurse took a special interest. It became clear to me that all these people had a common interest – looking after me. They all wanted me to get me walking again. I also had lots of help at home. My family, my husband, my friends, my church – it seems overwhelming to reflect upon it – everyone was keen to help us. I couldn’t walk and we had a toddler and a new born. My mum came and stayed for 6 weeks. My husband came home from work and, as I like to say, “changed hats”. I couldn’t stand for long periods of time, so I couldn’t do normal household chores. I had friends who sent us their teenage daughters for two weeks to help. I had a friend who came every second Friday for the whole day for nearly a year, and another who came every Thursday afternoon for a similar period. We are very grateful. These people made sure we were fed, had a clean house, had clean sheets on our beds. Practical stuff. This meant I could focus on what was really important – getting back to health. I had to be able to walk. Some members of my team changed over time. As I became stronger after the initial physiotherapy, I was referred to an injury recovery specialist physio. He developed a program that was intended to get me off the crutches. He taught me a lot about core muscle strength. He taught me how to walk up stairs. It’s funny how you don’t think about these things until you can’t do them! As time went by, it got easier. I went back to work – changed my hours a bit to make it easier getting to work with the full blessing of the other WLF Accounting and Advisory partners (my work place). We arranged a car park straight across the road from work so that I didn’t have far to walk. I used the lift. Other people carried my files and/or my laptop. I continued my physiotherapy and I got stronger. I shifted from two crutches to one with the encouragement of my physio. He introduced me to pilates, which has become the corner stone to my continued fitness. I gave up the crutches just after my daughter turned 2. I realised I needed to stay as fit as I could be, so in addition to the pilates. I started personal training with Jo who understood my condition and was willing to tailor a program that suited my strength levels. Initially all my training was water based. It took a few years before I was strong enough to do personal training on land. To this day, I continue the physiotherapy, pilates and personal training twice a week (land and water). I’ll never run a marathon, but I did a 30km trek in 2016 so I’m doing ok. It wasn’t deliberate to begin with, but I’ve built a team around me who continue to support me. There’s no way I could have done this on my own. My team were, and still are, an important part of how I have regained my strength and maintain it. I continue to stick at it. If I let one aspect of my regime slide, everything else suffers. These personal health issues have been a lesson in how teams work. I’ve learned that it’s important to find the right people for the job and be open to changes as needs change. I’ve learned I can’t do it all on my own and I shouldn’t try. This applies to everything I do, not just my health. Life is easier when you’ve got a team around you.